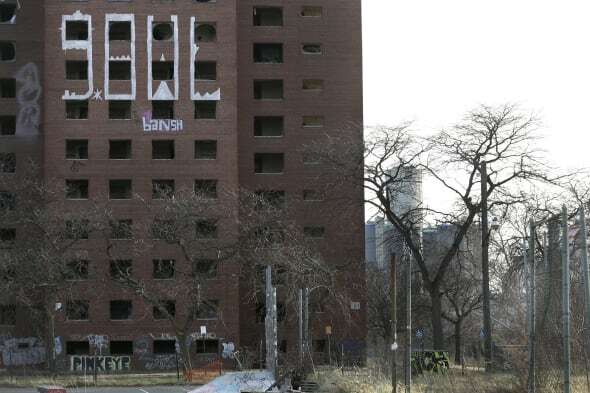 DETROIT -- The final phase of demolition began this week for a well-known vacant Detroit housing project that once was home to boxer Joe Louis and members of the Supremes. Crews started using heavy equipment Monday to take down four 15-story towers that are part of the former Frederick Douglass Homes, better known as the Brewster projects. Louis once lived at the project near downtown Detroit, as did members of the Supremes before the musical trio became vital voices of the Motown sound. Other demolition work began at the site last year. The demolition is being paid for through $6.5 million in federal funds. Participants in a ceremony marking the start of the demolition work Monday included Mayor Mike Duggan; his immediate predecessor, Dave Bing; Don Graves, executive director of the President's Council on Jobs and Competitiveness; and Sandra Henriques, assistant secretary of the U.S. Department of Housing and Urban Development. The public housing project was built in 1935 as Detroit's first publicly funded housing development for African-Americans. But the neighborhood and the project went into a decline. The Detroit Housing Commission began moving residents out, and the last of them left in 2008. Henriques said she hoped Monday's work would be more than the end of an era and would help clear the way for new development in the area, which is near Detroit's relatively prosperous downtown and Midtown neighborhoods. "Today's demolition isn't about removing an eyesore," Henriques said. "It's about restoring hope and promise to the citizens of Detroit." Officials said they don't have immediate plans for the site. "This is history. This is part of me," Detroit resident Bernard Glover, 59, told The Detroit News as he watched crews work. "When they tear them down, they are tearing down a part of me. I just want to bring on (something) new so that we can enjoy it and let some of the people born and raised here to move back here and enjoy it."